Just Seen: God Bless America / Jackass 3D / Futurama – The Nuge. Frank Murdoch (Joel Murray) is a depressive middle-aged loner with Larry David-esque grievances. When he’s diagnosed with cancer, Curb Your Enthusiasm meets Henry: Portrait of a Serial Killer as Frank takes revenge on society’s ills, or as Chris Morris once put it: “they don’t deserve punishment…they deserve GUNISHMENT“. Bobcat Goldthwaite’s self-indulgent wish-fulfilment fantasy is essentially a platform to air his misgivings with the state of 21st-century America, and through Frank imagines how he could right some of these perceived wrongs. It’s capably made, but the script is overrun with stilted, preachy soapbox-style dialogue. And its central argument – that civillisation is uncivil – is flawed. Most of Frank’s irks are found on television. Can’t he just turn the telly off? I hate most of the stuff Frank hates too, but I try not to worry about such fripperies by actively avoiding reality TV. And he labours under the ever-enduring misconception that things used to better – “golden age thinking” as Michael Sheen put it in Midnight In Paris. Such wistful sentimentality of a better yesterday forgets the barbarism and bigotry of earlier civilisations – traits far more deplorable than the ‘annoying habits’ of Frank’s ire. (Is talking in a cinema really worthy of a death sentence?). After an absurdly heavy Friday night (finishing up at around 7am), I found myself in the market for a specific grade of brainless hangover viewing, come Saturday afternoon. Well, they don’t make ’em more brainless than Jackass, that ragtag bunch of gleeful idiots who willingly fling their bodies (and their dignity) into the line of fire – be it paintballs, dildos or feces – all in the name of preposterous, grotesque, hilariously juvenile entertainment. The Jackass formula remains largely unchanged since its MTV days, though the budget is a little more swollen and an extra dimension was added for the theatrical release of this third outing. Like the first two movies, this is essentially a feature-length episode of the TV show, without the spectre of censorship looming. And by God, it still ticks the boxes. It’s horrendously puerile, scraping below the lowest of all denominators, and about as cinematically lucid as a portaloo full of dogshit (such a toilet makes an appearance in the movie, incidentally), but barely a minute went by where I wasn’t guffawing like an idiot or screaming in disbelief. Unsophisticated gut-level gratification at its most distilled level. 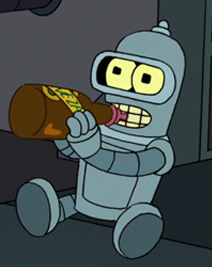 Getting cancelled by Fox and reincarnated by Comedy Central was maybe the best thing to happen to Futurama. Whilst Matt Groening’s crankier, older creation languishes on into perpetual staleness, its younger cousin remains in rude health, shark definitively unjumped. There’s been some golden moments in this first half of season 7 (the second half airs next year). Though I’d hesitate to call it a golden age, the writers have flexed some lofty ambition in their sci-fi storylines (Bender confronting his own lack of free will a particular highlight), along with some of the best puns and wordplay you’ll find on the small screen. (“There’s a damn!” “Damn!” “There’s a grate!” “Great!”) The season finale which re-imagines all the characters as animals in a nature documentary is perhaps a bold experiment too far, but it remains the only animated sitcom to fully utilise the limitless possibilities of its medium, to glorious effect. each month. It is best to consult your insurance agent before you proceed to borrow against.